We asked council members about what it was like to work together including their motivations and what they found rewarding or challenging. They each had something unique to say about their experience, but many expressed an earnest desire to help those in need. Why did you want to be in student council? Lincoln ‘29: I wanted to be in student council because I like to help and I wanted to rescue animals. Gardiner ‘29: I wanted to join student council because I wanted to help the school and help the world become a better place. Hunter ‘28: I wanted to be in student council because I like to help people in my community and this is a way I can do that. Vanesa ‘28: I wanted to be in student council because we can give back by helping people. Alex ‘27: There are a lot of charities and causes that need help and not a lot of people help them. Finn ‘26: It is a real experience and it can teach you things that are helpful in life like how to cooperate and be a leader. Luke ‘26: To listen to other classmates and not just to yourself. Georgia ‘29: I've learned that everybody in my class is really enjoying giving the donations to the dogs, cats and other animals that don't really have that much. Lottie ‘26: It is not all about you. It is about how everyone can be a leader and about representing other people’s ideas. Madelyn ‘26: I learned we all have to participate and not just one person can do the project by themselves. Alex ‘27: I researched about the mistreatment of animals and learned that there are so many dogs that people don’t want that need help. Cole ‘27: I learned that not everyone has everything they need and we can help the animals by giving them our donations. Scroll through the photos below to see our fall council members and their Lucky Dog Donation Drive posters! Gardiner ‘29: I liked how we all gathered in a group. We shared our interesting ideas and we all discussed how we were going to do something and we all came up with a solution. Liam ‘29: My favorite part was when we came up with the plan to save dogs and cats because I love animals and I want them to be happy. Hunter ‘27: My favorite part was seeing how many people in our community wanted to help Lucky Dog. Hunter ‘28: I thought it was hard to pick the right thing to do. A lot of people had good ideas and it took us two classes to figure it out. I kind of felt surprised when we combined all of our ideas together. I didn’t know we could organize it like that. Vanesa ‘28: The hardest part of the process was figuring out what to do. People had different suggestions. Should we donate things? Or give money? It was hard to decide that as a group. That's what we struggled with. Hunter ‘27: The most challenging part was choosing which things we were going to ask people to give. Henry ‘28: The hardest part was making the posters because we had to think of what to draw to make people want to donate things. How did you pick Lucky Dog and what are you doing to help? Matthew ‘28: At first we talked about helping people hurt by hurricanes like with Puerto Rico Strong last year. Then Ms. Schubert came up with the idea of Lucky Dog. She said they are an organization that helps pets left behind after hurricanes. We voted on our ideas and we came up with the idea of a donation drive. I voted for Lucky Dog because I thought about the people in my class that have pets and how they would feel if they had to leave them behind. Georgia ‘29: We voted and I brought donations of dog and cat food that we had at my house. Allie ‘27: We’re asking for leashes, collars, dog toys, and cat toys and we’re having a dress down day on Friday where people pay one dollar to dress down to raise money. Luke ‘26: We are making a big impact on the organization because we have a whole school donating treats and toys for the cats and dogs...we are helping as a whole community! This program is just one example of how we teach character and leadership skills every day in the Lower School. Student Council provides our students an authentic leadership experience working toward something they truly care about. They look outside of themselves to serve the needs of the larger community while learning basic leadership techniques and group dynamics. Our student council members dream big, make actionable goals and reflect on the outcomes of their work. That’s leadership with purpose. Spring Student Council elections will take place the week of February 11-14. Before the elections at the February 8th all-school assembly, Student Council advisors Ms. Lisa Ellis, Ms. Karin Mitchell and Ms. Jackie Schubert, will provide the students with information regarding the program including goals, past projects, characteristics of class representatives and details about the election process. Past council members will also share their personal experiences with the group. Georgia ‘29 says it all, "I think if someone wants to be in Student Council, that is a great choice!" 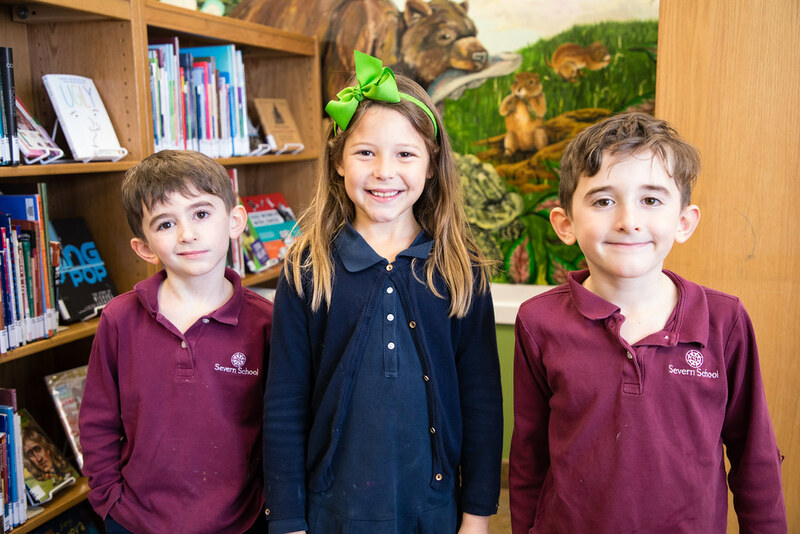 Is your child interested in taking on a leadership position in the Lower School? Encourage them to participate! Any and all students are welcome. Author Molly Saum ‘17 is a sophomore at Elon University in North Carolina where she studies communications. She is working as an intern for the Severn Communications Office during her winter term and will return this summer. 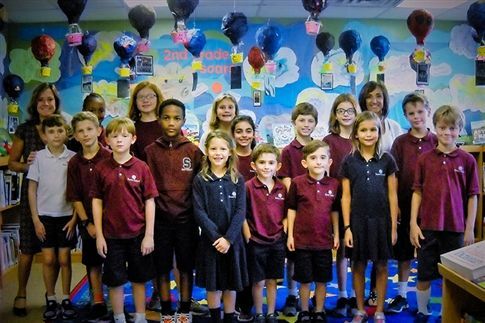 The fall Lower School Student Council crew!